He led a sedentary lifestyle for several years until one day he realized that he had crossed the barrier of being unhealthy. Here is Arjun Narayan’s inspirational story in his own words. I couldn’t believe my ears when the guy at the Levi’s store said, “Sir, a 32” size jeans would be perfect for you”. I was shocked because I always wore a 44” jeans until recently! My normal day would start pretty late. If early, I would begin my day at 8 AM or even 9 AM depending on how late I slept the previous night. I had absolutely no grip on my meals, the greasier and tastier the meal – the higher the chances that I would go for it. I led sedentary lifestyle and walked less than 2,000 steps a day. Dinner times would be erratic and could be as bad as 2 AM. Beer cans would get opened for the smallest event that called for a celebration. All in all, it was as bad as it could get. I also stated that I probably get a zero for a quiz about nutrition or what protein was, what carbohydrates are as my knowledge on this was absolute zilch. Before a doctor could ask me to get the situation under control regarding my health, I wanted to take charge. Another thing that kept bothering me was, I could never purchase a ready to wear trouser from the market as most brands did not cater to a 44” waist size. I decided to hire a personal gym trainer. My story was similar to many out there who join the gym to lose weight. I was regular at the gym for a period of three months, but I did not shed a single gram of weight. When I analysed to check what was I doing wrong– I realised, despite working out in the gym there was absolutely no discipline on my diet. While, I was battling the dilemma on how to rectify the situation, I bumped into these two statements in an article – ‘Weight Loss is 80% diet and 20% exercise’ and ‘Abs are made in the kitchen’. These statements made me think about this entire weight loss program in a different way”. Now, I knew that I had to get a personal coach who can advise me on diet and be by my side if I wanted this weight loss exercise to get anywhere”. I had been following Vishal Gondal on Twitter for about 2 years and I knew about GOQii. What made GOQii interesting was the ‘services’ component to the business in addition to the product. I never evaluated any other option as I knew it had to be GOQii. Any other band would not solve the problem as I would have the data – but the bigger concern was not knowing what to do with the data. 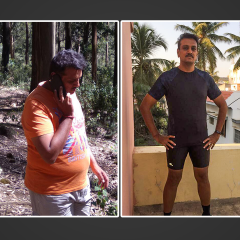 In Jan 2016, I took up GOQii and came up with a project for myself #FitBy40 and the goal of the project was to lose 40 KGS by the time I turn 40 (which is this month). 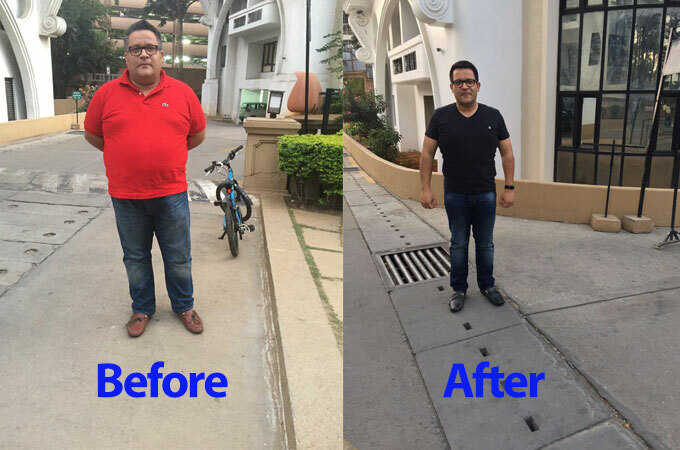 By the 9th month – 5th September to be precise, I had lost 36 KGS! 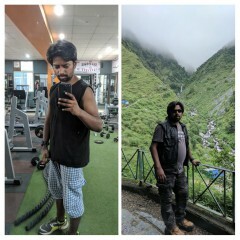 I started my GOQii journey at 115.1 KGS and by September I was at 79 KGS. Today, diet and exercising is my pet topic. I get up at 5:30 AM and on bad days it is not later than 7:15 AM. 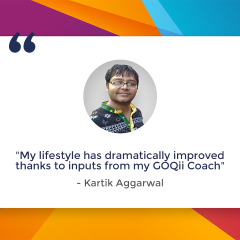 I attribute my success to my GOQii coach Kruti Jain. While, I have been extremely sincere and diligent about the entire process, she is the one who gave me the direction. In the beginning she started advising me on what kind of a meal would be ideal for me, and it gradually started building from there. As I started seeing the results, I was motivated to push harder. Now I can hold fitness sessions for an hour to a group of people and tell them how they can get a grip on stuff and the best part is that it is practical and doable. A year ago, I would have felt that this would be impossible to achieve – but trust me it is very doable. Today, people come up to me and say that I am an inspiration to them and it feels so good and if I have to look back, I don’t think I could have achieved any of this without Kruti’s assistance. My day starts with 2 hours of tennis / an hour in the gym and then I go for a swim in the evenings or for a walk. A newly opened restaurant in town doesn’t excite me anymore. What excites me is going for a run on the treadmill and running for 45 minutes or playing tennis for 2 hours. What excites me even more is going to a readymade garment store and trying out new trousers as my waist size is now down to 32″ from 44″. The last I had worn a 32″ jeans was probably in 1999 or so or maybe even earlier. What does Coach,Kruti Jain have to say about her player Arjun Narayan? Achieving such a goal would’ve required drastic dietary modifications and intense workouts. I explained to him the challenges expected on this path and tried convincing him to choose a rather easier and sustainable path of correcting the lifestyle which will automatically lead him to his health goal. He did agree to this but, only in words (for the sake of it). As a coach, I helped him understand the nature and the nutritive quality of different foods, the trick of balancing meals, healthy snacking, and the impact of foods or lack of food / nutrients on our behaviour and food choices (cravings). These are just a few points to mention but our discussions went beyond the basics. On the workout front, he chose his activities on his own as doing something of your interest is what keeps you going. I only helped him change and modify the workouts when his body got used to these activities. According to me, what helped in this case was the player’s strong determination to get to his goal. He was religious in monitoring his progress and kept revising his plans and targets. Not only that, if the progress wasn’t as expected for a particular week, he had me reason it out & find out the limiting factors. If I asked him to slow down (workouts) or to not be so strict on the diet front (to avoid its negative impact on his health), he would try to understand the “Why?” in detail and argue if not convinced. You just couldn’t stop or slow him down because he could only see the goal and the distance in between them. Diet: He was already following a low fat, high protein diet which was helping him lose weight. Change the workout at the right time or modify them so that the rate of weight loss does not fall (combination of workouts like swimming/ tennis/ walking/ gym cardio). For me its not working, I am following GOqii coach instructions but cant reduce even for 1 kg in one month. Getting unhappy and frustrated. 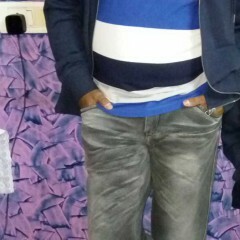 I am a Goqii member, and nowadays am feeling the change. It has long term benefits. And this blog inspiring me more. Arjun Narayans story was highly motivating. After reading the story, realise that with healthy eating excercise tone your body, feels you more energized. Very inspirational man…. Congratulation for what I u achieved. GOQII plz keep these kind of stories frequently so v wil I not lose our tempo in reaching our target. Cheryl says well done. I have a lot of admiration for your fitness. I feel hopeless as I just can’t loose weight. I am 61 and weigh about 80kg. I can’t stand to go on the scales or see the doctor regarding this as I know what he is going to say. is there anyway for me.. Highly precise statement and will be a good show with the combination of well understanding and suggestive Coach + sincere wish consisted gentleman. Wow! Arjun’s journey is very inspiring. I have been with GOQii for the last four months and have a superb coach in Hema. The inches have reduced but weight not to my liking. Will push further and yes the moot point is to watch your diet. Believe me it’s the toughest challenge but 115 to 70 is simply awesome achievement worth emulating!! The story 100% motivate me ? Thanks Arjun and Kruti for sharing the journey of weight loss. Highly motivating story. Truly Motivating as I’m also passing through a transition.